Scroll down to see the top not-for-profit colleges and universities in North Carolina offering online degree programs. East Carolina University offers online degrees at the bachelor's and master's level. Undergraduate programs delivered online are all degree completion programs, which require students to have completed the first two years of coursework at a community college. ECU's online bachelor's programs include four options in business administration, six options in education, as well as degrees in communications, health services management, hospitality management, industrial distribution and logistics, industrial technology, information technologies, and nursing. More than 30 master's degrees are available, including environmental health, nursing, nutrition, software engineering, and construction management. More than a dozen education master's degrees are offered to students who are licensed to teach in North Carolina. ECU also has online programs leading to teacher licensure or add-on licensure and post-master's nursing certificates that qualify nurses to take national certification exams. Active-duty military personnel stationed in North Carolina pay in-state tuition rates. Online students are eligible for financial aid. ECU provides services for online students including IT support, access to the library, textbook ordering, and a testing center. Residents of Alabama, Massachusetts, Minnesota, Maryland or Ohio are not eligible for ECU's online programs. The largest community college in North Carolina, Wake Tech certainly shows it with the breadth of its online offerings. An Associate in Arts and an Associate in Science degree are on tap for students headed to a four-year university. They're joined by more than 20 Associate in Applied Science degrees in everything from Accounting to Web Developer, not to mention an Associate in Fine Arts. The school really excels with certificates - boasting more than 75. Nearly a third are in the fields of Business Administration, Criminal Justice Technology, or Office Administration. Fayetteville Technical Community College serves more than 40,000 students annually, including a large number of military personnel stationed at Fort Bragg, North Carolina. The college expands its reach and offers students flexibility through many offerings that can be completed 100 percent online. Online programs mostly lead to an associate degree or certificate. Associate degrees include Associate in Arts and Associate in Science programs for students who plan to transfer to a four-year school. Career degrees are offered in fields such as business, emergency management, and education. The college also has dozens on online career certificates covering topics in business, computers, criminal justice, and emergency management. Certificates usually require one or two semesters of study. At Central Piedmont Community College, online students can complete an associate degree for transfer to a four-year school or they can take credit or non-credit classes to gain jobs skills. To ensure that online students can enroll in the classes needed for their degree, the college has a detailed list of every class that must be completed for an Associate in Arts or Associate in Science degree. That eliminates some choice students might have if they attend on-campus, but the trade-off is knowing the courses they need will be offered online. Career students can choose programs in fire protection technology, construction management, and computer technology. Non-credit students can take online classes for personal enrichment or career enhancement. North Carolina State University offers nearly 70 online degree programs and certificates at all levels, with most of the offerings clustered in the academic areas that are among the university's strongest, including engineering, technology, science, and education. At the bachelor's level, UNC offers an online degree completion program in leadership in the public sector, which is for students who have already earned an associate degree and transfer in at least 60 credit hours. NC State offers nearly 40 online graduate degrees. Online master's programs lead to degrees in fields ranging from education and engineering to textiles, including some highly specialized degrees such as Master of Forest Biomaterials. Some programs, including the Master of Business Administration, require some residency courses and only allow students to enter the program during the fall semester. Online-only students pay tuition based on the number of credit hours they are taking; out-of-state residents pay a higher tuition rate. NC State offers online students support such as access to proctoring services, academic advising, a technology help desk, and access to online resources at the university library. Students enrolled in online degree programs are eligible for financial aid. The University of North Carolina at Greensboro offers online programs that lead to seven bachelor's degrees, 12 graduate degrees, and 15 post-baccalaureate or post-master's degrees. The undergraduate programs are all degree completion programs, and students must have at least 60 credits, typically earned through an associate degree from a community college, to apply. Bachelor's degrees are available in liberal studies, peace and conflict studies, philosophy, business administration, human development and family studies, public health, and supply chain management. Online master's programs are available in fields including nursing education or administration, information technology and management, global apparel management, library and information studies, education, liberal studies, dance education, and peace and conflict studies. UNC-Greensboro also delivers the Doctor of Education in Kinesiology and Education Specialist in Educational Leadership through its online program. Online students are eligible for financial aid and can take advantage of UNC-Greensboro's payment plan option to spread the cost of a class over a semester. Services available to online students include technical support, academic advising, tutoring, help with speeches and presentations, career services, and online book ordering. Guilford Technical Community College students who plan to complete all courses for their degree online can sign up for priority registration status, which allows them to be first in line for registration and to access courses that are only open to eDegree students. To receive priority registration status, students are required to take on online readiness workshop, with workshops scheduled throughout the year. Online programs include an associate degree for transfer students and 14 technical associate degrees in fields such as criminal justice, IT, and medical office administration. More than a dozen certificate and diploma programs, which require fewer courses than a degree, are also 100 percent online. GTCC limits the enrollment of some online programs. Western Carolina University offers online bachelor degrees for students who have earned an associate degree and are completing the last two years of work on the degree. Admission to the online programs is competitive; students must first be accepted into WCU and then apply to the program they are interested in. Bachelor of Science degrees offered online are birth to kindergarten, criminal justice, emergency and disaster management, emergency medical care, and an RN to B.S.N. program. The college also offers online programs leading to a Bachelor of Business Administration in Entrepreneurship or in Administration and Law. Online graduate degrees include construction management, entrepreneurship, health sciences, human resources, project management, nurse educator or nurse leadership, and school administration. WCU also has online programs leading to a Master of Arts in Education in Elementary and Middle Grades Education or in Special Education, and a Master of Arts in Teaching Special Education. WCU has a testing center on campus for proctored exams, and it also participates in the UNC Online Proctoring Network to assist students in finding qualified proctors. Out-of-state online students pay higher fees, but those fees are substantially reduced for students using Department of Defense or Veterans Administration benefits. The University of North Carolina at Wilmington offers three undergraduate degrees and several graduate degrees in an online or mostly online format. Undergraduates can earn a degree in clinical research, nursing, or elementary education online. Graduate students can earn a master's in biology or liberal studies, or choose among three master's programs in education. The Bachelor of Science in Nursing is an online accelerated program for Registered Nurses. It offers six start dates each year and allows nurses to complete their bachelor's degree in as little as 12 months. The clinical research program requires students to have completed most prerequisites before entering the online program. The master's level teaching programs include a Master's in Education in several specialties for teachers with licensure, and a Master of Arts in Teaching program that leads to initial licensure for students who earned an undergraduate degree in a subject other than education. Online students are eligible for financial aid, and UNCW offers departmental scholarships for students who meet specific criteria, such as the Jewel and Joseph Cross Scholarship in Education for a student in the M.A.T. program. Pitt Community College has 10 associate degrees, about three dozen certificates, and eight diplomas that can be completed entirely through online coursework. Associate degrees include fields such as business, information technology, and healthcare management. Online certificates are available in disciplines including business, IT, and early childhood education. Several healthcare-related certificates are also offered online, including MRI technology and mammography. Many of the diploma programs, which take longer than a certificate but less time than an associate degree, also prepare students for careers in healthcare, including medical dosimetry, nuclear medicine, and dental office administration. All new online students must complete an orientation session, and students at a distance may qualify to take it online. Central Carolina Community College has an extensive array of programs where students can complete at least some of the required courses through online work. Online programs generally have a blended format, but some programs, such as Library and Information Technology, can be completed entirely online. Overall, the college has more than 130 programs, including transfer options for students who plan to go to a four-year school, and career and technical degrees, diplomas and certificates. Thanks to the college's mobile app, students don't even have to be at their computer to attend class, they can work on assignments via their smartphone. Fayetteville State University offers online degree programs through the College of Business and Economics and the College of Arts and Sciences. Two graduate degrees are offered online: Master of Science in Criminal Justice and MBA, giving students an online option for one of the university's most popular graduate programs. Fayetteville State was ranked No. 72 for Best Online MBA program in the 2017 U.S. News ratings. The 10 online undergraduate programs are all degree-completion programs for students who have an associate degree or a significant number of college credits already. One of the most popular undergraduate majors at FSU is nursing, and registered nurses can complete their Bachelor of Science in Nursing through online classwork. Stanly Community College has online programs to prepare students for an immediate career or to pursue a four-year degree. The Associate in Arts is a transfer degree, and students with an AA degree can transfer to a college within the University of North Carolina system, and many other schools, as a junior. For many of the career programs, SCC gives students a choice of earning a certificate, diploma, or associate degree in a specific subject, such as accounting or early childhood education, depending upon how much time they want to put into the training. Other programs with all three levels of credentials available online include criminal justice, business administration, and information technology. The University of North Carolina at Charlotte offers undergraduates the option of completing a bachelor's degree in engineering technology, kinesiology, or nursing online. UNC-Charlotte also has online programs in education, engineering, and nursing that lead to a master's degree or graduate certificate. Students entering the degree completion programs must have an associate degree and will finish the last two years of work through UNC-Charlotte. Online graduate programs include a Master of Art in Teaching, Master of Education and Master of Science in Nursing, all with several specialties. The university also offers an online M.S. in Engineering Management, a technical alternative to an MBA. Depending upon the class, students may have to log in at a specific time to participate, or they may have to come to campus for a lab or to take a proctored exam. Online students can qualify for financial aid, and some scholarships might be available, depending on the program of study. UNC-Charlotte offers technical help to online students via a toll-free helpline or email. The university's authorization to deliver online programs to residents of other states varies by program and state, and the university is not authorized to provide any programs in Alabama. Forsyth Tech Community College has a wide range of associate degrees and certificates students can complete entirely online. One program, the Associate in Arts, is designed for students who plan to transfer to a four-year school to earn a bachelor's degree. However, the vast majority of online programs are for students who are seeking job skills they can use immediately. Most of the programs are in the field of business, including project management, supply chain management, and many aspects of business administration. Other programs cover criminal justice, health care management, and IT support. The University of North Carolina at Chapel Hill offers a variety of online programs at the master's level or higher. Most of the programs combine online classes with some requirement to attend limited on-campus meetings or to engage in professional experiences. Programs available include a Master of Business Administration, Master of Public Administration, and master's degrees in radiologic science, molecular diagnostic science, and technology and communication. An executive master's degree is available in health care administration. UNC-Chapel Hill also has distance learning doctoral programs in health leadership and physical therapy. Program details and requirements vary widely among these diverse degrees. The MBA program, for example, requires candidates to participate in live weekly online classes, complete self-paced multimedia coursework, and travel to take part in global immersion events. The executive doctoral program in health leadership allows students to do most of their work online but requires six on-campus visits over two years. The university also offers nine certificates that can be earned online. Gardner-Webb University offers fully online programs that allow undergraduates to complete a bachelor's degree in one of nine subjects. The university also offers online options leading to master's degrees in business, education, English, nursing and sport pedagogy. The bachelor degree completion programs - offered in accounting, business administration, computer information systems, criminal justice, elementary education, entrepreneurship, health care management, nursing, and religious studies - require that students transfer into the university with at least 48 credit hours completed. Gardner-Webb charges a flat tuition rate per credit hour, with an additional online learning technology fee added for online courses. Students pay the same tuition rate no matter where they live. Online students in a degree program are eligible for financial aid. Students enrolled in a degree completion program are eligible for the Barry Hambright Scholarship, which is awarded based on need and academic merit. The university grants academic credit for prior learning gained through employment or other activities by evaluating a prior learning portfolio compiled by the student. Gardner-Webb University is not authorized to accept online students who live in Alabama, Iowa, Massachusetts, Minnesota, Montana, Wisconsin or Wyoming. Classes for a wide range of programs, from transfer degrees to certificates in Java programming, are available online at Craven Community College. Students who want to transfer to a four-year school can earn an Associate in Arts or Associate in General Education. Students seeking to enter business can earn an associate degree or shorter-term diploma or certificate in fields such as accounting or business administration. Information technology students can choose from the same three kinds of programs with specialties such as IT support services, Linux operating systems, or accounting technology. All students must complete an orientation course before starting their first online class. The number of students enrolled in a program can affect how often a course is offered online. Rowan-Cabarrus Community College has an extensive list of online programs, including nine associate degrees, five diploma programs, and 30 certificates. Three of the associate degrees are transfer programs for students who plan to continue their education at a four-year school. The Associate in Arts, Associate in General Education, and Associate in Science help students to complete the general education requirements needed for whatever bachelor's degree they decide to pursue. The vast majority of RCCC's online programs are career programs. The certificates - which generally take a semester or two - cover topics such as office technology, computing, and medical office administration. Diploma and associate degrees include accounting, business administration, and office administration. The University of North Carolina at Pembroke has a Bachelor's in Interdisciplinary Studies (B.I.S.) program that allows students who earned an Associate of Applied Arts degree in community college to transfer all those credits and apply them towards a four-year degree. B.I.S. degrees offered online include professional studies, allowing students to major in advertising, economic development, financial administration or office administration; applied information technology; criminal justice, with majors including sociology and substance abuse; and public and non-profit administration. All the undergraduate degrees offered online at UNCP are degree completion programs and students should complete all general education requirements before applying to the online program. The university also has online master's degree programs in elementary education and public administration. Students enrolled in UNCP's online programs have access to the same support that is offered students who attend classes on campus, including academic advising, bookstore, library, the writing center, and financial aid. They also have access to a network of qualified proctors they can use if they are required to take a proctored test. Tuition is the same for online classes and in-person classes, although online students pay a small additional distance instructional support fee. Lenoir Community College has more than 50 online programs leading to degrees, diplomas, or certificates. Students who are interested in teaching regular or special education at any grade level can complete their teaching degree online by starting at Lenoir and transferring to East Carolina University's online teaching degree-completion program. Students seeking other four-year degrees can earn a transfer associate degree in a variety of career pathways at Lenoir before transferring. The college also has a wealth of online programs in technical and career fields, including in-demand fields such as unmanned aircraft systems. In some fields, such as office administration, students can work toward anything from a specialized certificate to an associate degree. Asheville-Buncombe Technical Community College has three associate degree programs that students can earn 100 percent online. The Associate of Arts (General Pathway) is for students who want to transfer to a four-year college after completing two years at A-B Tech. The online Associate of Applied Science programs are for students interested in business administration or fire protection technology. Online certificate programs cover topics in human services, education, and fire protection. Before taking online classes, students must take an assessment test to determine their readiness for online learning. They may be required to take a brief online course to learn the technology used for online learning, and some students may have to take a computer course before starting online classes. Appalachian State University offers bachelor completion programs leading to degrees in education, communication, or communication studies in an online format through its distance education program. To enter these programs, students should have completed the first two years of undergraduate coursework. Appalachian State also has online programs that lead to a master's degree in education, school administration, library science, or nursing, and to education specialist degrees in administration or adult and developmental education. Some programs are set up in a cohort format, in which a group of students moves through the coursework together. Courses are only offered once for each cohort, so students must be able to take the courses when they are offered. A Bachelor of Science in Career and Technical Education (CTE) is being offered for the first time in fall 2016. The CTE program is a full-time program, and students in this program must student teach in North Carolina to earn teacher licensure. The university will not offer a distance education program, including an online class, if too few students enroll in it. Rules governing financial aid for online students are the same rules that apply to on-campus students. VOLT (Vanguard Online Learning through Technology), Vance-Granville's distance learning wing, runs five degree programs. The first is the Associate in Arts, a transfer degree that corresponds with University of North Carolina requirements. The others include associate degrees in Criminal Justice Technology (which also has one certificate program), Business Administration (with a pair of certificates), Medical Office Administration (which features a trio of certificates), and Global Logistics & Distribution Management Technology (which runs a quartet of certificates). Outside of VOLT, students in traditional programs can take advantage of individual online courses. Surry Community College has eight online options for students who want to earn an associate degree. One program, the Associate in Arts, is for students who plan to transfer to a four-year school and earn a bachelor's degree. Students who complete this degree are eligible to transfer with junior status into a school within the University of North Carolina system. Most of the other online programs give student the option of earning a non-transfer associate degree or a certificate. Online programs include advertising and graphic arts or criminal justice technology. Business topics include business administration, accounting, and office administration. All students who are new to online learning must complete an orientation session before starting their online classes. North Carolina Central University has six bachelor's programs, six master's programs, and seven certificates that can be completed entirely online. Available bachelor's programs include behavioral and social sciences, hospitality and tourism administration, and early childhood education (birth-kindergarten). Online master's include educational technology, library science, and three options for counseling: career, mental health, and school. Certificates cover a range of fields, including health informatics and E-learning. NCCU uses the Quality Matters guidelines to ensure all online classes provide a consistent experience for students, with a modular format, tutorials, and clearly defined learning outcomes. NCCU is the No. 13 HBCU, according to the 2018 U.S. News list, which also ranked it as No. 31 in Top Public Schools in the South. Wayne Community College offers several degrees designed to transfer, namely, the Associate in Arts and the Associate in General Education. But it also has specialized Associate in Applied Science degrees, diplomas and certificates that are meant to be standalone credentials. Available programs are generally related to business administration or office administration, the latter in either a medical or non-medical environment. Criminal justice technology and accounting are also represented. Wayne isn't offering the course you need this semester? There are 57 other schools in the North Carolina Community College Virtual Learning Community through whom Wayne enrollees can pick up credits. Students who want the convenience of online courses can earn a fully online associate degree from Alamance Community College and be assured they can seamlessly transfer to a four-year college in North Carolina. ACC's transfer agreements with other schools make its online Associate in Arts degree fully transferrable. The college also offers an online Associate in Applied Science in Fire Protection and a general education degree for students interested in an allied health career. Students who want to gain career skills without earning a degree can take a program leading to an online certificate in subjects including accounting, early childhood education, or web design. Students seeking training for a career in cancer information management, criminal justice technology, or supply chain management can earn an Associate in Applied Science degree online through Davidson County Community College. So can students planning to transfer to a four-year college who want an Associate in Arts or Associate in General Education degree to transfer credits. DCCC also has several programs that allow students to take at least half of their required classes, but not all of them, online. Degrees partially available online include accounting, business administration, and pharmacy technology. EMTs, teachers, and nursing assistants can also take Continuing Education courses online through DCCC. In addition to offering two-year degrees designed to transfer into the University of North Carolina System- an AA, AS, Associate in Fine Arts and Associate in General Education - South Piedmont Community College runs associate and certificate programs that fall into four areas: Health, Business, Engineering Technologies and Services Technologies. The college provides academic advising over email and phone to distance learners. Though there are no full-fledged distance programs, the advisers can point to online courses for most programs. Haywood Community College in western North Carolina owns three different teaching forests that are used in its forest management programs, including an online certificate program in forest management technology. That particular program requires students to visit campus for field experiences, but most of Haywood's online programs can be earned entirely online. Options include an Associate in Arts program for students preparing to transfer to a four-year school. Other associate degree programs online include business administration, accounting, and criminal justice. Students interested in early childhood education can earn an associate degree or a range of certificates in areas such as toddler care, preschool, or ECE administration. Students who plan to transfer to a four-year school can earn an Associate in Arts - College Transfer degree through online classwork at Southwestern Community College. This 60-credit program allows students to transfer to a college or university with junior status. Once they earn the AA, students can take advantage of transfer agreements with Western Carolina University and the University of North Carolina system. Students seeking career training will find Southwestern has a wide range of Associate of Applied Science and certificate programs online. Business administration students can choose from four degrees, two diplomas, or three certificates. IT majors can choose from three degrees or four certificates. Other programs online include medical office administration, early childhood education, and accounting. Winston-Salem State College offers a variety of online degree programs at the graduate and undergraduate level. Most of the undergraduate programs are degree-completion programs, designed for students who have an associate degree or who have a substantial number of college credits they can transfer to WSSC. Students who have already completed an accredited medical laboratory technology program and are certified as a medical laboratory technician can enter an online program leading to a bachelor's degree in clinical laboratory science, which has clinical and nonclinical components. The college offers a similar degree-completion program for registered nurses who want to complete a Bachelor of Science in Nursing. The Bachelor of Interdisciplinary Studies is open to students with at least two years of transferrable credits. The 120-credit Birth to Kindergarten Education program has an early intervention and preschool concentration with 99 percent of coursework offered online. Master's programs available online include Master of Science in Rehabilitation Counseling and Master of Science in Nursing with an advanced nurse educator concentration. The University of Mount Olive has an associate degree program and two bachelor's degree-completion program available in a 100 percent online format. Classes for all these programs are offered in an accelerated, five-week format, and students can enter the programs at six points during the year. Coursework is delivered in an asynchronous format, allowing students to log into their classes at the time that suits their schedule as long as they complete the work by the deadline set by their instructor. The Associate of Science in General Studies is specifically designed for adult learners who have little or no college credit. Once students earn the associate degree, they have completed their general studies requirements and can enter a bachelor's program. Mount Olive's Bachelor of Science in Criminal Justice and Criminology is open to students who are at least 21 years old. The college accepts transfer credits and credit earned through certain standardized exams. Students who have completed Basic Law Enforcement Training may be eligible for additional transfer credits. The RN to Bachelor of Science in Nursing program is open to nurses who have an associate or diploma in nursing and an unencumbered nursing license. Campbell University offers online undergraduate, graduate, and certificate programs in several disciplines. The Bachelor of Science (BS) and Bachelor of Arts (BA) degrees offered by the university are completion programs that allow students to transfer a maximum of 64 semester hours towards their degree. At least 31 semester hours must be completed at Campbell University. Students can earn a bachelor's degree in the following fields: business administration, Christian studies, criminal justice, elementary education, liberal arts, homeland security, information technology security, and psychology. A number of Bachelor of Applied Science (BAS), Associate of Arts (AA) and Associate of Science (AS) degrees are also available online. At the current time, Campbell University offers three graduate-level degrees that can be pursued online: Master of Business Administration (MBA), Master of Science in Clinical Research (MSCR), and Master of Education (MEd). By enrolling in two courses each term, students accepted to the MBA program can expect to earn the degree in 12 months. The MSCR degree is offered by the College of Pharmacy and Health Sciences and can be completed in two years on a full-time basis. Students can also follow a part-time course of study. A 21-credit Certificate of Christian Studies is available online. Queens University in Charlotte, North Carolina, was ranked No. 20 for Universities in the South in 2016 rankings compiled by U.S. News and World Report. The university offers four online master's degrees. The Cato School of Education has an online Master of Arts in Educational Leadership, which qualifies graduates for K-12 principal licensure in North Carolina. There is also a non-licensure option for students who are interested in educational leadership without becoming a principal. The Knight School of Communication offers an online Master of Arts in Communication that combines communication theory with expertise in emerging media. Candidates for this degree must create a hands-on capstone project. The online Master of Nursing program follows the track for clinical nurse leaders and prepares students for the Clinical Nurse Leader certification exam. The McColl School of Business offers an online MBA with a leadership emphasis. MBA students have access to mentors and an executive coach. MBA candidates must take part in two campus visits, once at the start of the program and the other at the midpoint. Lenoir-Rhyne University offers eight master's degrees through its online and distance education programs. The Master of Arts in Community College Administration includes an intensive internship. The Master of Science in Exercise Science is delivered online and requires students to gain experiential learning through practicums. Students in the Master of Arts in Human Services program have a choice of professional tracks: addictions counseling, career development, or human services management. The Master of Arts in Leadership has two options. One is a 33-credit interdisciplinary program in General Leadership, while the University Leadership program focuses on higher education. Both programs require an internship. Students seeking a Master of Science in Nursing can concentrate in nursing education or nursing administration. The Master of Science in Online Teaching and Instructional Design is open to K-12 teachers, college faculty, and business people or trainers. The Master of Arts in Teaching leads to teacher certification. Coursework for all these programs is delivered fully online. Students may enter any of the programs at the start of the fall, winter or summer semester and they may attend as full-time or part-time students with no cohort to remain in lock-step with. The Graduate School of Arts and Sciences at Wake Forest University offers three Master of Arts (MA) degree programs that can be pursued online. These are: MA in School Counseling, MA in Clinical Mental Health Counseling, and MA in Human Services. Each counselling program requires the completion of 60 credits, 18 credits of which must be comprised of courses from the specialty track (school counseling or mental health counseling). Students who complete either of the counseling programs will be eligible to sit for the National Counselor Examination for Licensure and Certification. The MA in Human Resources program consists of 39 graduate credits, 30 credits of which must be counseling courses. The remaining credits are comprised of administrative or management courses. Students who graduate from the program can apply for their Human Services - Board Certified Practitioner (HSBCP) credential. The university also offers a Master o Studies in Law (MSL) degree that can be completed entirely online. Students have the option of specializing in one of two tracks - human resources or health law and policy. Courses are delivered asynchronously to give students 24/7 access to lectures and class materials. The MSL degree can be completed after five semesters of continuous enrollment. North Carolina colleges provide an exhausting number of online courses and degrees. So how do you find the best spot for you? Fortunately, the state has developed multiple resources to prevent that process from becoming overwhelming. And we’re going to show you where each of them is. We’ll send you to searchable catalogs where you can filter for schools that meet your criteria. We’ll lay out possibilities for both high schoolers and military members to earn college credit online. Finally, we’ll make our recommendations for affordable colleges while steering you away from schools with accreditation issues. First, you can search for online degree and certificate programs across the UNC system by entering a keyword, degree level and/or academic field. The website will spit out every option that meets your criteria, complete with program length and tuition (both resident and nonresident)! You can further filter by duration, entrance exam requirements, campus, start date, services available, and cost. Click on a program to get an overview and fast facts or link to the program website. In a word: awesome. Second, enrolled and visiting students can find UNC courses by term, campus, subject and delivery format. Voila! A complete list appears. Because UNC Online also functions as an exchange, if you’re registered at one UNC campus, you can take online courses at another UNC campus without paying anything extra. (Something to keep in mind when you find the almost-perfect program.) The Equivalency Finder tool is built into the course catalog, so you can search for classes that will transfer to your home campus. Last, the UNC system has created an extensive proctoring network, making it dead simple to take exams from just about anywhere as an online student. Use the Find a Proctor tab, enter your location, and see a map of proctors along with their costs and availability. Instead of offering four-year degrees online, most University of North Carolina campuses provide degree completion options. In all cases, you can enroll at the school as a freshman and attend general education classes on-campus, picking up online coursework as it’s available. For distance learning purists, however, a better and more affordable option may be to transfer in credits earned online from community colleges. Which brings us back to the Virtual Learning Community. Click Find a Program to get a comprehensive alphabetical list of degrees, certificates and diplomas within the system. The Find a Course tool is more versatile, allowing you to search by type, location and/or title for every class in the NC Community College system — that’s 58 school catalogs in one place! You can then use UNC Online’s “Equivalency Finder” tool to make sure that coursework transfers into your degree completion program. Already tired of hearing how easy it is to find online degrees in North Carolina? We’ve got another website to show you, this one for private universities in the state. The association for North Carolina Independent Colleges & Universities (NCICU) is made up of 36 regionally accredited institutions, 15 of which run online degrees and/or courses. Which 15? Well, NCICU maintains a list of its members schools with online options and provides brief explanations about the degree level and field. It’ll link you straight to each college’s home page so you can look closer. Over three dozen NC colleges and universities participate in the Southern Regional Education Board (SREB) Electronic Campus, whose online program and course catalog provides yet another option for discovering programs. There are three main reasons to visit the Electronic Campus. The first is that it shows you which programs use an electronic rate for tuition — anything marked “E” applies a standard tuition to both North Carolinians and nonresidents, a good deal for the latter. The electronic rate is rare among UNC and community college programs, but there are a few hidden gems. The second reason to use the Electronic Campus is if you’re planning on leaving the state for your degree. Fifteen other Southern states are SREB members, and you can see which runs have cheaper electronic rates for nonresidents. Finally, the Electronic Campus presents the most straightforward way of finding a sizable, if not comprehensive, list of degrees and courses at select private institutions in the state, with Duke University, Gardner-Webb University, Gaston College and Queens University of Charlotte all participating. With less access to campus-based instruction, many active duty military personnel rely on distance learning programs to attain a degree. UNC Core is an initiative from UNC Chapel Hill specifically for military members looking to get their general education (i.e., core) coursework out of the way so they can enroll in a degree completion program. As a military member, you can either seek a UNC Core Certificate, which is composed of nine courses, from UNC Chapel Hill or take individual courses (self-paced or semester-based) that transfer to UNC system schools. While UNC Chapel Hill takes up the lion’s share of the catalog, UNC Core is a system-wide initiative. In North Carolina, the best way to save money on an online degree is often to start early, as in high school. Through the Career & College Promise (CCP), qualified North Carolina secondary schoolers can take up to 34 credits tuition-free. That’s a year of college. Essentially, you could be out and earning in three years instead of four. The state’s main route for high school students to go online is the College Transfer Pathway. Choose courses from the Associate in Science or Associate in Arts list, all of which qualify for general education credit across the UNC and NCCC systems. Circle back to the Find a Course tool at the Virtual Learning Community to discover where you can take that class in a fully online or hybrid format. North Carolina is a major hub for academic research and innovation, with the Research Triangle and Piedmont Triad competing for academic influence. Fortunately, this carries over to its distance learning programs. Search just about any ranking of online degrees that U.S. News & World Report publishes and you’ll find a few North Carolina colleges near the top. The state has especially strong showings in two online arenas you might expect, given North Carolina’s tech landscape — graduate information technology and graduate engineering — and one you might not: MBAs. Part of the strong showing is due to North Carolina State University, whose name keeps popping up. 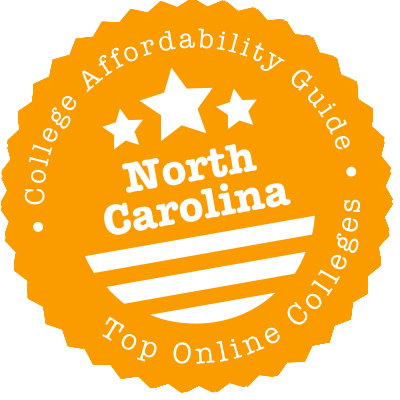 We’ve crunched the numbers to determine which of North Carolina’s colleges and universities provide not only a world-class online education but also an affordable one. The following is the result: 10 schools that meet our criteria for quality, flexibility, price, and use of financial aid money. (See the CAG Score next to their profiles in our ranking.) There’s a lot to take in, but after you catch your breath, compare their graduation rates and debt loads to other institutions’ at College Scorecard. Although it doesn’t use the UNC moniker, Appalachian State is a UNC school. Distance education at Appalachian takes place at the undergraduate and graduate degree levels. The Office of Student Financial Aid maintains a custom page for distance learners, but also look at the tuition and fees to get a sense of comparative pricing for traditional and distance learners. Although nonresidents of North Carolina pay more than residents, veterans and current members of the military plus their immediate families can qualify for reduced tuition. Online undergrads save money almost by default because Appalachian’s newly added bachelor’s degrees are all two-year completion programs. You can transfer in with an AA or AS degree from a North Carolina community college, where you’ll spend less on tuition. The baccalaureate diploma you earn at the end will still say Appalachian State. U.S. News & World Report ranks East Carolina University‘s graduate-level online criminal justice, education and nursing degrees highly. ECU also offers undergraduate degrees, but like other state schools in North Carolina, these are actually completion programs. The upshot is that you’ll save money by spending the first two years at a community college and then transferring. Don’t worry. You can do that online. Check out the Virtual Learning Community to see associate-level distance degrees and courses. North Carolinians get a better deal on online tuition and fees than nonresidents — that’s just part of going to a UNC system school. However, the school has expended eligibility for residency to active duty military personnel stationed in the state, as well as their dependents. It’ll maintain that bargain even if you’re reassigned. No matter your residency status, the Office of Student Financial Aid can show you how to apply for grants, scholarships and loans. NC State’s Online and Distance Education website can get you started on its 90+ programs, including degrees, certificates, and teacher licensure. Tuition rates are a wee bit complicated, but North Carolina residents get a substantial discount across the board. A limited number of grants & scholarships may also be available to online students—check details with the Office of Financial Aid. Military or veteran? Be sure to have a look at all the veterans benefits on offer! As we mentioned, NC State makes a super-strong showing in U.S. News & World Report rankings for its online graduate programs. If you’re considering an IT or engineering master’s degree, this is a school that you really should put on your shortlist. In tech, it’s right up there with USC, Virginia Tech, and NYU. University of North Carolina’s flagship campus has a range of options to attract prospective distance learners. In the military and need to take general education classes so you can transfer to a degree completion program? That’s what UNC Core is for. Looking to take an online class or two during the semester? UNC students, students at other campuses, high school upperclassmen and members of the general public are all welcome to enroll in Carolina Courses Online, run by the Center for Continuing Education. Don’t want to be restricted by semester start and end dates? Enroll in a self-paced course via correspondence or computer. Looking for a graduate degree or certificate? UNC has those, too, several of which (including its top-of-the-class MBA) are available at the SREB electronic rate. Learn more about financial aid and scholarships as well as tuition and fees at the Office of the University Registrar. Similar to other UNC schools, UNC Charlotte runs graduate programs alongside baccalaureate completion programs in lieu of four-year degrees. That means, you’ll probably want to transfer in from a state community college. Find courses and degrees at the Virtual Learning Community to see your options, then check out UNC Online’s “Equivalency Finder” tool to make sure your coursework will transfer. Once you’ve got the academics sorted, learn about tuition and financial aid in one place. The gist: You pay by the credit, so there’s no penalty for being a part-time student (with some exceptions). Although the terms “nontraditional students” and “distance learners” are no longer synonymous, there is substantial overlap. If that’s the case with you, you may find the section on scholarships for nontraditional students helpful. UNC Greensboro is a state school, so North Carolinians benefit from lower tuition and fees. However, nonresidents who choose an online modality can earn a UNCG graduate or undergraduate degree or certificate at a cheaper rate than if they pack their bags and head to Greensboro. The Financial Aid Office works with all students to maximize grants, scholarship and loans. If you’re choosing distance ed, you may fall into the category of adult and transfer student. If so, check out scholarships specifically for you. UNC Wilmington offers its fair share of online graduate programs plus a handful of undergraduate degrees. North Carolina residents benefit from lower tuition and fees at both credential levels. You’ll discover that online summer courses are slightly cheaper, plus they allow you to finish up earlier so you can enter the workforce. One more thing: Get to know the folks at the Office of Scholarships & Financial Aid. They deal with the things that make college, well, affordable. Western Carolina University, another UNC campus, features an array of online degree completion and graduate programs. If you’re attempting the former, you’ll need to transfer in credits, and WCU provides a number of methods for you to do so, including dual enrollment, military service and, of course, an AA or AS from a North Carolina community college. Military members coming from out of state get a special deal on tuition and fees that is considerably cheaper than the nonresident rate. The Office of Financial Aid will help get you sorted, no matter who you are. The Southern Association of Colleges and Schools Commission on Colleges (SACSCOC), also known as SACS, is one of six main regional accreditors in the United States. As the name implies, it accredits southern colleges and universities, including those in the Carolinas. Visit its homepage to search the 100+ SACS-accredited institutions in the Tarheel State. Jump over to the Accreditation Actions & Disclosure Statements section. Schools on any of the lists here have received a public sanction. A “warning” is the lowest level of sanction, and “probation” indicates a more serious breach of accreditation standards. Schools on probation can even be removed from accreditation if they do not come into compliance. Not every North Carolina college and university is in the SACS directory. That’s because some are nationally accredited, hold regional accreditation through a main campus in another state, or choose to forego accreditation. The Council for Higher Education Accreditation (CHEA) Database represents a complete list of both regionally and nationally accredited institutions. Researching the accreditation status of for-profit schools often requires extra sleuthing because such schools are often part of chains and hold accreditation elsewhere. That’s the case with three campuses owned by the same company — Education Management Corporation. In late 2016 SACS placed South University, a Georgia-based chain, on probation because of concerns the school was not financial stable. This extends to its branch campuses in North Carolina — the Art Institute of Charlotte, Art Institute of Raleigh-Durham, and South University, High Point. The accreditor’s concerns are well-founded. Education Management Corporation has recently closed several Art Institute campuses due to financial struggles. The schools in Charlotte, Raleigh-Durham and High Point remain accredited while on probation. Calvary Baptist, which offers distance learning options to enrolled students, claims it does not intend “to seek secular or Christian accreditation for its programs of study.” Therefore, it’s not in the CHEA database or on College Scorecard. Christian Bible College has a P.O. box for an address but no physical campus. That’s just one sign that it’s an unaccredited diploma mill. Therefore, it’s not in the CHEA database or on College Scorecard. DeVry, a for-profit chain with an online campus, is accredited by the Higher Learning Commission (HLC), a different regional accreditor. However, in 2016, the Federal Trade Commission sued DeVry for misleading prospective students, claiming the company/school inflated employment and income figures for its graduates. HLC has yet to sanction the school but has requested more information. In 2016 SACS issued Elizabeth City State, which offers online classes, a warning for one year due to “non-compliance with standards regarding administrative/academic officers, personnel appointments and evaluations, admissions, student records, and control of finances.” SACS will evaluate the school again in 2017 to determine if it is still out of compliance. The university remains accredited while on probation. University of Phoenix, a for-profit chain known for its distance learning programs, has a Charlotte location. Although it holds regional accreditation through the Higher Learning Commission (HLC), graduation rates at its Charlotte location are some of the lowest across the University of Phoenix system, according to College Scorecard. To be fair, its enrollees are about as likely to graduate within six years as students starting off at a state community college. But it costs a lot more to attend University of Phoenix than a community college. Southern Association of Colleges and Schools Commission on Colleges (SACSCOC): Everybody just calls it SACS. It’s the regional accrediting body for degree-granting colleges and universities in North Carolina. SACS accreditation is desirable because schools can offer financial aid and their credits tend to transfer more smoothly. eLearning NC: We’ve tried to succinctly articulate North Carolina’s distance education landscape, but sometimes it helps to see the information presented in another way. If that’s the case for you, the state’s eLearning Commission has put together this resource that links to both K-12 and college options for distance learning. North Carolina Department of Public Instruction: The Department publishes pertinent information for secondary schoolers. Online learners should take note of the Career & College Promise (CCP), which allows them to take college credits sans tuition. UNC Core: A Chapel Hill initiative that works across the public university system, UNC Core represents the simplest path for military members to earn general education credits online. After completing UNC Core, they can transfer to a degree completion program. North Carolina Independent Colleges & Universities (NCICU): If you’re interested in attending a private university, NCICU highlights the distance education offerings for 15 of its member schools. Southern Regional Education Board (SREB) Electronic Campus: The Electronic Campus is not comprehensive, but it is wide-ranging. It provides a searchable database of online degree programs or courses run by participating institutions in North Carolina and 15 other states. It’s particularly helpful for nonresidents wanting to find online programs that don’t charge out-of-state learners extra. UNC Online: It’s difficult to overstate how valuable this website is for prospective and enrolled UNC students. From it, you can find every online degree, online course and approved proctor in the UNC system. Virtual Learning Community: Another gem — this one for prospective associate degree-seekers. Discover every community college program and search for course offerings across the North Carolina Community College system.